The mobile payment ecosystem is characteristically fragmented with a host of different options that are vying for consumer attention as the technologies and services based on them progress toward maturity. NFC, Direct Operator Billing and Bluetooth Low Energy all have their strengths as transactional platforms whether that’s peer-to-peer, in-store or online and they all have a common goal: convenient, frictionless payments. Arguably, the focus on convenience hasn’t yet led to wholesale consumer adoption so stakeholders are keen to take a broader approach that focuses on making mobile payments and mobile money a feature of a holistic mobile user journey, one that includes m-commerce, promotions, loyalty and more; the obvious conduit being the much discussed mobile wallet. Here, Srinivas Nidugondi, Senior VP & Head of Mobile Financial Solutions at MEF member, Mahindra Comviva shares his insights on how Bluetooth Low Energy (BLE) combines these different requirements to put the consumer at the centre of the mobile experience. This is an excerpt from Mahindra Comviva’s contributed article which has just been published in MEF’s quarterly Mobile Money Bulletin, featuring insights, news and statistics on how this space has evolved in the last three months. Download it here for free. Commerce is steadily approaching universal commerce, shifting toward an integrated customer experience across online, mobile, and physical shopping. With mobile devices at the centre of universal commerce, merchants are making increasing efforts to drive their presence on multiple channels to deliver greater service and exposure to their businesses. In particular location-based commerce that captures consumers ‘in-the-moment’ has seen a surge if interest. For a merchant, the ability to identify a consumer’s location and deliver timely, relevant information, coupons, discounts and marketing messages is a compelling proposition that, if handled correctly, can bring significant benefits to consumer and merchant alike. Although no single technology is yet to hit mass market adoption, BLE is making headway with Apple (iBeacon) and PayPal (PayPal Beacon) both now shipping beacon hardware that makes it simple for retailers to build out location-based services. According to a recent report from ABI Research (BLE Tags and the Location of Things), BLE beacon shipments will hit 160 million units by 2019. To date there’s been plenty of well-documented deployments, with retail giants such as Tesco, Carrefour and American Eagle all experimenting with the technology, largely to drive offers and loyalty via mobile coupons and advertising, and from the mobile payments sphere there have been various trials that allow users to make payments using their smartphone. Indeed, BLE first entered the spotlight in the context of mPayments when Microsoft announced that it was experimenting with a combination of BLE and facial recognition technology to create a zero-effort payment system. Effectively there are two complimentary ecosystems – marketing and payments – making use of BLE. What’s interesting is how, when retailers work on an approach that operates in the overlap between the two, there are real benefits in terms of sales, customer acquisition and loyalty. A key focus of retailers has always been how they can bring more traffic into their physical stores and convert visitors into purchasers. More recently, attention has also been directed towards simplifying the payment process and offering consumers a more engaging, immersive shopping experience — all with the ultimate goal of driving revenue. BLE, in keeping with these needs, stands poised to transform the shopping lifecycle: from pre-tailing, to payments, and post-payments. BLE presents a strong business case allowing merchants to engage with consumers at the right time. By pushing information to them at specific areas of a store, BLE can be used to influence purchase decisions, allowing consumers to make more effective, more informed decisions. 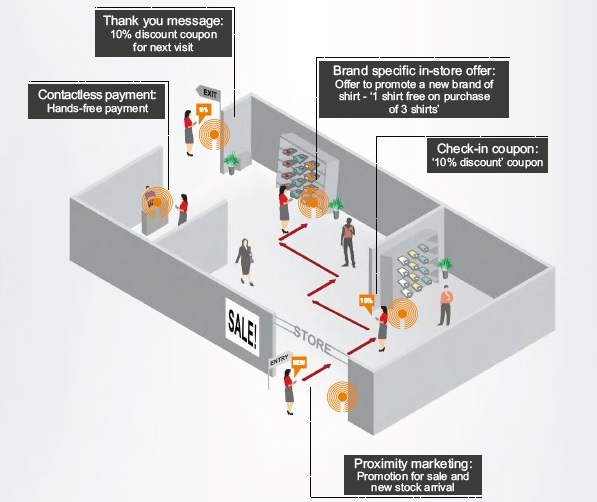 Retailers can use BLE to provide welcome messages, product information, advertisements, offers and coupons when consumers approach or enter the store. [youtube=https://www.youtube.com/watch?v=65bvs59QsJI&w=400&align=right&rel=0]Srinivas Nidugondi, Senior VP & Head of Mobile Financial Solutions discussing the growth of mobile payments. Although BLE has witnessed growth in marketing and customer engagement, its application in the contactless payments space is still relatively young. That said, there are already some interesting use cases that have the potential to marry in-store mobile marketing to mobile payments. PayPal’s hands free payment system for example detects when a consumer comes within the range of a Beacon, the PayPal app on his Bluetooth-enabled smartphone connects to the Beacon and requests a token. The Beacon sends certain parameters, comprising Unique Identifiers and Cryptographic Keys. The phone verifies the information relayed by the Beacon and checks in the consumer based on the preferences that he or she has set. If the location and store are both new to the app, the consumer is prompted to check-in. The app encrypts the data for the Beacon to forward on – uninterrupted – to the PayPal servers. The server decrypts the data and checks-in the consumer. As the consumer checks in, the merchant receives the consumer’s details—primarily name and photo ID. At the check-out, the merchant only needs to select the correct name and photo. The merchant system makes a call to PayPal requesting money from the user ID, and the transaction occurs. Essentially this represents a contactless or card-less transaction, facilitated by facial recognition by the cashier and verbal confirmation from the customer. Merchant engagement with consumers needs to continue on from the payment stage. After the first transaction has been made a key focus is – and should always be – ensuring that the consumer returns. For example, Beacons at the collection counter, payment aisle, or exit can be used to push messages to consumers that will give them reasons to return. Thank you messages, discount coupons that are redeemable on subsequent visits, information on expected stock, and updates on upcoming sales can all be delivered in the moments after a purchase. And, if retailers build-out loyalty services that sit inside a mobile wallet for example, Beacons can also be used to remind customers about their point totals and suggest rewards or discounts that can be redeemed against them. Crucially, BLE is now being experimented with at a level that captures the whole mobile user journey as it brings together three complimentary ecosystems – retail, marketing and payments. Retailers that tap into this approach and move BLE to a central engagement strategy will experience accelerated growth. To read more about the progress of BLE and hyper-local marketing through the mobile retail experience, download the Mahindra Comviva whitepaper Bluetooth Low Energy – steady, systemic penetration of hyper-local commerce here.